If I had a dollar for every Pop Up I saw or read about these days I’d be writing this post from the comfort of my yacht anchored in the Mediterranean. 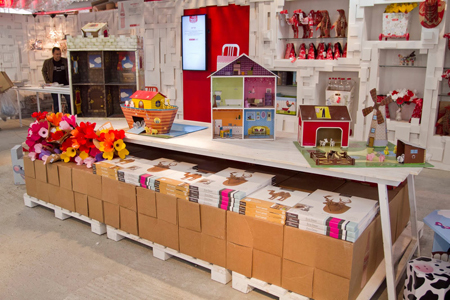 So many now though are constructed to offload last season’s sale items, to fill the space before a retailer moves into a new location or because marketers convince brands they need to jump on the wagon regardless of it fitting strategy. These Pop Ups lack the innovation, cleverness and appeal that we saw from many early incarnations (think Prada’s Central Market in 2007, Nike Runner’s Lounge established in Canada in 2005 or Joost’s Greenhouse – which has toured Melbourne, Perth and Sydney in different forms). This Easter saw two truly great spaces pop up – Coca-Cola’s Give It Back in Israel and Aesop in Selfridges London. The soft drink space opened in Tel Aviv during the Passover holiday, which apparently also happens to mark regeneration and cleanliness in Israeli society – very appropriate. 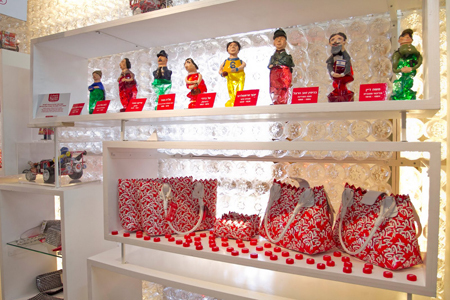 The Coca-Cola Recycled Collection is an offering of products made from recycled Coca-Cola cans and bottles including shirts, jewellery, hats, handbags and furniture. Customers can purchase any of these items in exchange for empty bottles / cans and a little cash. The key driver of the event was to educate the community about the benefit of recycling through the idea of ‘recycled fashion’. Audio visual installations explained the methods for manufacturing bottles, the process of recycling and opportunities for the recycled products. You’ve probably guessed by now that I’m a huge fan of Aesop and their latest Pop Up at Selfridges London, provides another excuse for me to pump their tyres. Designed by Royal College of Art graduate, Hiroko Shiratori and Aesop’s brand director, Dennis Paphitis, the space has been constructed from thick rope, natural wood and coir matting and has been described as “texturally warm” (I’m interpreting that as being a contrast to the stark black / white acrylic clad fitouts with bright fluoro lighting that many cosmetic brands operate out of!). It houses Aesop’s skin, hair and body collection and also provides the opportunity for customers to receive personalised consultations from an Aesop expert. Leveraging the marketability of having product ranges based on plant derivatives isn’t enough for Aesop. Their philosophy of a healthy and natural existence travels further than skin deep and they have consistently worked with cutting edge designers to create places that have a strong emphasis on natural materials, such as stone, wood, glass and fibres. Every Aesop space is different yet still conveys the brand message, without dependence on a cookie-cutter approach to store design. The Selfridges display will run until 31 May. Why dont they try making a biodegradable can instead for their wasteful and un necessary product which fills football stadiums daily with unrecycled cans.